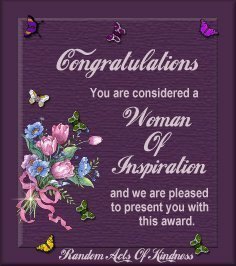 Woman Of Inspiration Award from Elpidio. I just had a visit to your site and I liked it, the cats look so beautiful and I also loved the pictures in Israel. So it would be my pleasure to give you my award. I am honoured to give your site my SuperSite award. Congratulations !!! Your site meets all of our qualifications that makes for a great site. We enjoyed our visit to your site, keep up the good work. Once again congratulations.